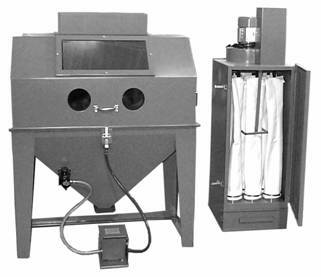 The applications of Trinco Dry Blast Cabinets are virtually limitless - cleaning, de-burring, decorating, de-flashing, etching, finishing honing, peening, etc. All of these uses and more can be accomplished easily with quick sweeps of the gun nozzle. Scale corrosion, old paint and other surface materials are removed in minutes leaving metal surfaces free of foreign matter and contamination. Even tough mill scale is quickly and efficiently removed. In today's market appearance is also very important. Let us assist you to achieve the look that will set your product apart from your competition. Simplify the handling of heavy parts with a Trinco™ turntable, dolly and track system! Place the part on the turntable and roll into cabinet on track assembly. 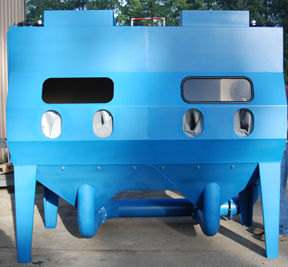 Rugged construction and simple design result in reliable, maintenance free service. Available turntable diameters up to 60 inches and weight capacity up to 3,000 Pounds! Available in both manual and electric powered turntable rotation. Available with vertical or horizontal doors. Stationary turntables also available. You can add rubber lining to this machine. 5. Amount of compressed air you have available in CFM, or the horsepower rating of your compressor. 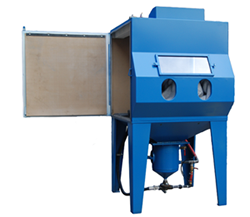 With this information, you will then be prepared to talk to an Airblast abrasive blast equipment salesperson. Talking to a knowledgeable salesperson will save you money and lost production time. On the other hand, if you succumb to the temptation of special deals and low prices, you may ultimately lose both money and production time. 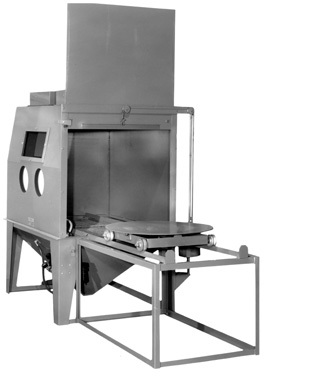 Blast cabinets can be divided into manual and automatic machines. Manual machines can be further divided into the classes of standard duty(best used abut 6 hours or less a day}, and heavy duty machines(for more than 6 hours of use per day). 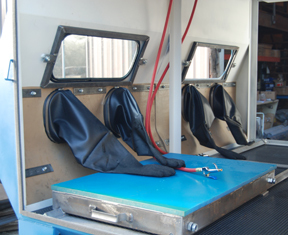 Heavy duty Pressure Blast Cabinets with gum rubber lining. Direct pressure cabinets utilize and A.S.M.E. coded pressure vessel to hold abrasive media. When the foot pedal control is depressed air pressure is released into the pressure vessel, pressurizing the pot and then forcing the media from the pot through the blasting hose to the nozzle. Most pressure blast cleaning is done at 40-60 PSI. Due to these lower pressures, abrasive media breakdown is greatly reduced even though a high volume of media is being directed at the part to be cleaned. Most media is recovered through the recycling process. 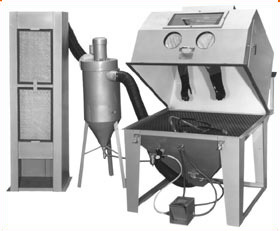 Direct Pressure blast cleaning is ideal for the very tough jobs, for applications where large surfaces must be cleaned quickly, for production blast cleaning or when the job requires the use of heavy mesh sizes of silicon carbide, aluminum oxide, garnet, etc. Call us to try one out in our shop before you buy.